In this recipe the dough is quite wet, but the beignets turn out fluffier and have more hollow pockets (which is great for stuffing with fresh raspberries). This is a little messier, but use a lot of flour on your board and don't be afraid to add as much as you want when rolling it out. Make sure your oil is hot for the best texture. confectioners' sugar for serving, as much as you think you'll need—then double that! Heat the milk in a small saucepan over medium-high heat until small bubbles form at the surface. Remove from the heat, add the buttermilk, and then pour into a stand mixer bowl. Whisk in the yeast and the sugar and set aside for 5 minutes. Add the flour, baking soda, and salt, and mix on low speed, using a dough hook, until the dry ingredients are moistened, 3 to 4 minutes. Increase the mixer speed to medium and continue mixing until the dough forms a loose ball and is still quite wet and tacky, 1 to 2 minutes longer. Cover the bowl with plastic wrap and set the dough aside in a draft-free spot for 1 hour. Pour enough peanut oil into a large pot to fill it to a depth of 3 inches and bring to a temperature of 375°F over medium heat (this will take about 20 minutes). Lightly flour your work surface and turn the dough out on it. Sprinkle the top of the dough with flour, gently press to flatten, fold it in half, and gently tuck the ends under to create a rough-shaped round. Dust again and roll the dough out into a ½-inch- to ¹/³ -inch-thick circle. Let the dough rest for 1 minute before using a chef's knife, a bench knife, or a pizza wheel to cut the dough into 1 1/2-inch squares (you should get about 48). Gently stretch a beignet lengthwise and carefully drop it into the oil. Add a few beignets (don't overcrowd them, otherwise the oil will cool down and the beignets will soak up oil and be greasy) and fry until puffed and golden brown, turning them often with a slotted spoon, for 2 to 3 minutes. Transfer to the prepared plate to drain while you cook the rest. Serve while still warm, buried under a mound of confectioners' sugar, with hot coffee on the side. The beignet dough can be made up to 8 hours in advance of frying. Line a baking sheet with parchment paper and spray it with nonstick cooking spray. After cutting the dough, place the beignets on the paper and place another greased sheet of parchment paper, sprayed-side down, on top. Wrap the entire baking sheet with plastic wrap and refrigerate. 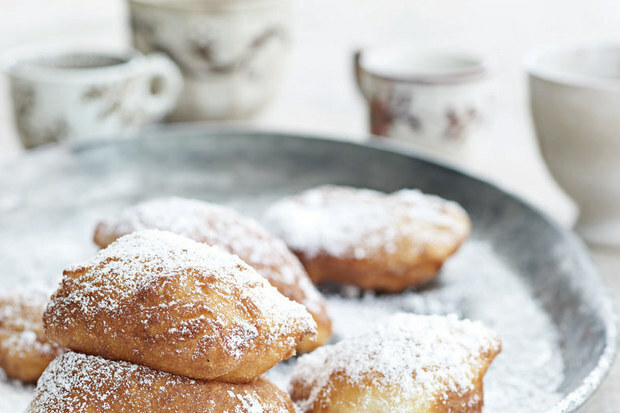 The beignets can be fried straight from the refrigerator.